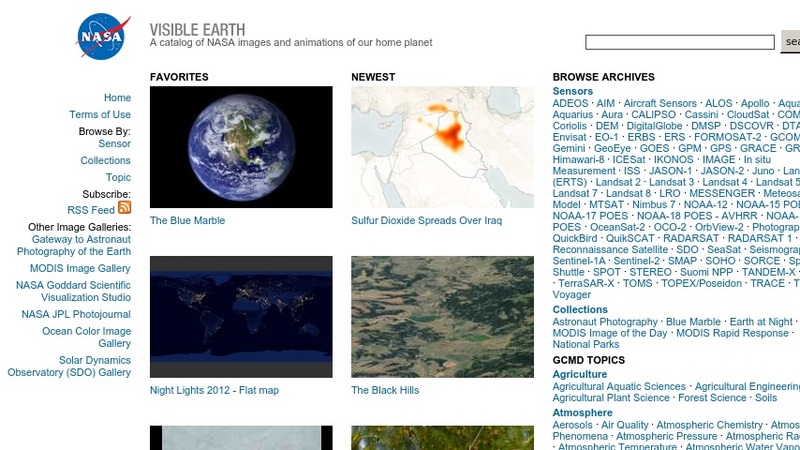 NASA's Visible Earth is a searchable directory of images, visualizations, and animations of the Earth. The images are also listed under the following categories: agriculture, atmosphere, biosphere, cryosphere, human dimensions, hydrosphere, land surface, oceans, radiance or imagery, solid earth, locations, and satellites. Accompanying each image are credits, data about the image, the satellite it was taken from, a description of what is shown, and a high-resolution viewable image.